Fight fight off Separatist droids alongside the clone trooper army this Halloween, in our Padme Amidala costumes using this Blaster and Holster. The toy weapon comes with a vinyl belt that is made to match Amidala’s white outfit and has a holster for her blaster (blaster requires two AA batteries, not included). The blaster has a black handle, a silver barrel, an orange tip, and when you pull the trigger it makes sound effects. Tie on the holster with our Padme costumes and keep the blaster nearby for when Anakin becomes Darth Vader. 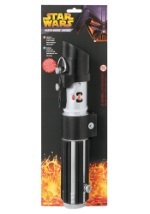 Check out our other cool Star Wars accessories!